Croatia striker Ivica Olic has signed a new two-year contract with German club Wolfsburg after deciding against a move to Premier League side Stoke. Stoke boss Mark Hughes recently said he was "pursuing" the 34-year-old, whose previous deal expired in June. Wolfsburg have won the Bundesliga title once - in 2008-09 under current Fulham boss Felix Magath. 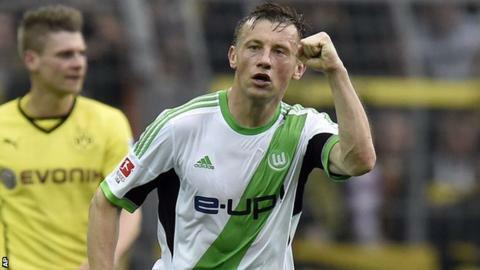 "I am happy that there is finally clarity over my future here and I am happy to continue playing for Wolfsburg," said Olic. The ex-Bayern Munich player has scored 14 goals for Wolfsburg this season. Wolfsburg are fifth in this season's Bundesliga and chasing a Champions League qualification round place. Olic, who has scored 18 goals in 90 appearances for his country, arrived from current Bundesliga champions Bayern in 2012 and has also played for Hamburg and CSKA Moscow.